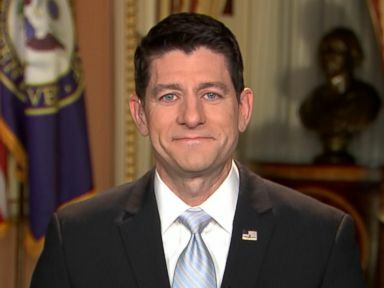 With the latest polls showing growing disapproval of the Republican's tax bill among Americans, House Speaker Paul Ryan addressed the skepticism today over the $1.5 trillion bill that Republicans argue will boost the economy and give taxpayers of every income group a tax cut. "I think minds are going to change and I think people are going to change their view on this," Ryan, R-Wis., said on "Good Morning America" Wednesday as Republicans are on the verge of passing a massive rewrite of the tax code. An analysis by the Congressional Budget Office, a nonpartisan agency that projects the effects of legislation on the nation's finances, found that the tax bill would increase the deficit by roughly $1.4 trillion over the next decade. Ryan said “the last thing we would want to do” is reverse the cuts if the deficit is increased. The House speaker said the Republican Party will next turn its attention to getting government spending under control. “There's two things we think are necessary for getting the debt and deficit under control -- spending control, getting spending under control, reforming entitlements and cutting spending; and growing the economy," Ryan said. Ryan argued that the $25 billion cuts to Medicare in the next year that the CBO projected “will not happen.” He did not, however, seem committed to preventing further cuts to the Medicare program beyond 2018. "There are some provider issues that we may be addressing as you know," Ryan said. "Some providers in the Medicare field in some cases are getting overpaid. We want to make sure that’s being dealt with. But as far as you’re talking about beneficiaries, we're not focused on that." “We’re going to fix the PAYGO problem which is an arcane budget problem and budget rule,” Ryan said, referring to the “pay-as-you-go” rule that would, in this case, require Congress to offset costs of making large tax cuts by reducing entitlement spending. Ryan said Congress will approve lapsed funding for the Children’s Health Insurance Program before leaving Washington for Christmas. House Speaker Paul Ryan Paul Ryan speaks to "Good Morning America," Dec. 20, 2017. The Senate passed the $1.5 trillion bill early Wednesday morning, 51-48, in a party-line vote. The bill now heads back to the House after the Senate parliamentarian found that three provisions of the measure violated a Senate budget rule. The bill is expected to pass and land on President Donald Trump’s desk for him to sign. Ryan also announced that the House will roll out a series of reforms on the system Congress has to handle sexual harassment cases. According to Ryan, the new reforms will include barring taxpayer funds to settle sexual harassment claims and implementing a system that allows victims to know their rights and where they can go to find relief. The Office of Compliance revealed Tuesday that Congress had paid out $115,000 to settle House sexual harassment claims between 2008 and 2012. “This is one of those watershed moments -- not just in Congress but in America -- where we have to get this right, where we have to make sure that victims have the rights, that due process is respected and that we deal with this issue as important as it is in a respectful way,” Ryan said. Ryan said he's "not going anywhere anytime soon" but would not elaborate on his plans for re-election and beyond the 2018 midterm elections. A recent Politico report suggested Ryan was thinking of stepping down as speaker and leaving Congress after the 2018 elections and before the next term of Congress.